Shawn Chapman Holley, right, heads into court with celebrity client Lindsay Lohan and her mother, Dina. She assisted Johnnie Cochran on O.J. Simpson's defense "Dream Team"
Los Angeles, California (CNN) -- Lindsay Lohan's lawyer is ready for her close-up. "As much as I used to laugh at Tyra's tips on 'America's Next Top Model,' they actually work," Holley quips, leaning back in a pair of black, red-soled Christian Louboutin pumps. Holley is no ingénue. She's a criminal defense attorney who toiled for five years in the gritty trenches of the public defender's office and backed up the late Johnnie Cochran during O.J. Simpson's murder trial. Her hot client these days is Lindsay Lohan, who spent the summer in court, jail and rehab for a DUI-related probation violation. Lohan was sent back to jail Friday morning, but Holley appealed and Lohan was out by midnight. A hearing will be held October 22 to determine whether Lohan violated probation a second time by failing a drug test. "Shawn's the celebrity go-to lawyer right now," attorney Carl Douglas said of Holley, with whom he worked on the Simpson case. As bloggers, entertainment news shows and tabloid media outlets transform the courtrooms of Los Angeles into a virtual reality show, Holley -- along with Blair Berk, who represents Mel Gibson -- are the moment's undisputed legal "It Girls." Holley is a criminal defense lawyer to her core, and she burns with a passion for the underdog. She says she's daunted by Hollywood's "fancy people." Her manner is cheerful and open; her quick laugh and glib one-liners can disguise her status as a serious player in the courtroom. But other observers say such sniping is typical in a competitive, big-ego profession that until very recently was dominated by men. "She's not a lightweight. Anyone who says otherwise is sexist," said Laurie Levenson, a professor at Loyola Law School who follows high-profile cases. "When you hear petty remarks, they are just that -- petty, jealous remarks." Holley should no longer be viewed as just a "sidekick" to power lawyers Johnnie Cochran and Howard Weitzman, Levenson added. "She's really coming into her own. She takes on the basket cases. She has high-maintenance clients, and she's able to maintain them. She does it with great professionalism." She takes on the basket cases. She has high-maintenance clients. Douglas agreed. "I can't fault Shawn at all for Lindsay's predicament. I'm not sure any lawyer could have handled it better than Shawn." The legal "It Girls" (they're not girls, of course; Holley is 48 and Berk 46) share more than a high profile: They've both represented Lohan. And each, at one time or another, has quit the case. Berk referred Lohan to Holley. Neither would reveal details of how the handoff came to pass. "You'll have to ask Blair that one," said Holley, who in a similar DUI case got reality TV star Nicole Richie in and out of jail in 82 minutes. Suffice it to say that Berk didn't feel she was getting through to her famous client. For a while, neither was Holley. It's a moment that makes every defense lawyer cringe. The client begs for one more chance, but the judge won't buy it. For Holley and Lohan, the scenario has become all too familiar. The plea deal Blair Berk cut for Lohan in the 2007 case began to fall apart in July. As Judge Marsha Revel ticked off examples of Lohan's failure to take responsibility, it became obvious that Holley would not be able to make the save. Shawn Chapman Holley maintains her cool while client Lindsay Lohan breaks into tears in court in July. "Please, Shawn," Lohan begged. "Pleeeeaaase!" Ten days ago, when trouble arose a second time, Lohan called Holley. The timing couldn't have been worse. On that day, another Holley client, Reggie Bush, was giving back his Heisman trophy. She'd been up all night helping Bush work on his statement. Back to court Holley and Lohan went. Lohan showed little emotion Friday as Holley asked Beverly Hills Municipal Court Judge Elden Fox if he would consider bail. "May I be heard?" Holley asked. "Nope," the judge responded and Lohan was handcuffed and led away. "That shocked me," Holley said. She followed Lohan into the holding cell, and "she just locked eyes with me," Holley recalled. "Promise me you're going to get me out of here," Lohan pleaded, according to Holley, who quickly replied, "I promise you." She asked Fox to reconsider, then informed him she would appeal. "From there, I just put on my rocket shoes," Holley said. She appealed to the Superior Court, writing, "There is no question that Ms. Lohan is entitled to bail while the alleged probation violation is being adjudicated." To get in front of a judge, she raced across town and ran into the Criminal Courts Building in downtown Los Angeles as everyone else was leaving. The courtroom where appeals are heard was already dark. She was steered to Superior Court Judge Patricia Schnegg, who agreed with her and set bail at $300,000. There was Lohan family drama to deal with, as well. Earlier in the day, Dina Lohan sat with her daughter and Holley in court in Beverly Hills. Lindsay Lohan's father, Michael, who has been ordered to stay away from Dina, his ex-wife, was also there. Afterwards, he lit into his daughter's lawyer, mother, and management team in front of camera crews. He called them "enablers" and accused them of "destroying my daughter's life." "I'm not going to dignify those comments with a response," said Holley, who in the past has pointed out that her client is estranged from her father. When Lohan was first sentenced to jail she tweeted, comparing herself to the Iranian woman sentenced to be stoned to death for adultery. Much ado was made over the expletive stenciled on the nail of her middle finger. Holley strikes a pose by her front door. The portraits on the left are of musician Miles Davis. Holley quit the case for reasons more complicated than tweets and manicures, but returned to Lohan's defense within days because she felt her client needed her. There were no pity tweets the second time around. Holley thinks Lohan is heading in the right direction. "She had to come to terms with all the things that were happening in her life," Holley said in August. "I think she was hoping that things could be different than they were. When she realized that things could not be different, she had to accept reality." "It's a work in progress," Holley said over the phone on Saturday. According to the Hollywood rumor mill, the Lohan case took a toll on Holley's friendship with Berk. Both tiptoe around the rumored rift, so its origins remain murky. "It's all good now," Holley said. Berk declined to give details, but said, "Shawn's a champion for stepping up." Holley said she visited Lohan on 11 of the 13 days she was in jail, and camera crews swarmed her BMW station wagon every time. "It was absolutely crazy," Holley said. "I just don't feel they would have been there for a positive Lindsay Lohan story. If she was building a house for Habitat for Humanity, I don't think they would have been there." Holley empathizes with Lohan: "Lindsay Lohan is a 24-year-old girl. I was a 24-year-old girl. I did a lot of wild, crazy, fun stuff. We probably all did. But we didn't have all of that stuff photographed and publicized." She believes Lohan will overcome her troubles. "She's tough, and she's tough on the people around her. When you're working with her, and for her, and she's tough on you, you can get grrrrrr -- but I respect her and I admire her and I really think she's going to come out of this a superstar. I really do," she said. It's another day in court, another pair of red-soled Christian Louboutins for Holley, this time in a summery shade of tan. She's come a long way from her public defender's paycheck: The designer kicks go for $695 and up. "I call a big part of my practice Celebrities Behaving Badly," Holley says, navigating her station wagon through a spaghetti bowl of freeways on her way to a hearing. On this August morning, her attention is on the Calorie Commando case. 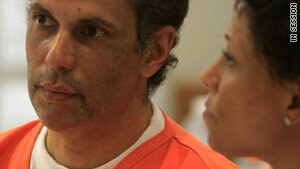 Holley is defending former "Calorie Commando" Juan Carlos Cruz, who's accused of plotting to kill his wife. Her client, former Food Network chef Juan Carlos Cruz, is accused of trying to hire three homeless men to kill his wife. He has pleaded not guilty. Los Angeles is a car culture. That means busy criminal defense attorneys spend a lot of time idling in the exhaust fumes. Some are chauffeured and work from the back seat, but Holley has become adept at driving both BMW and BlackBerry at the same time. She dispatches a long list of incoming calls, briefings, legal motions and other mini-crises over the speaker phone with her legal assistant, Jentry Collins. They've worked together 12 years and have an easy, bantering rapport. "You're my best friend," Collins coos as they sign off. Holley is under a surreal fisheye lens, and even the smallest development in a case can overload her BlackBerry to the point of meltdown. There are reputations to protect! Careers to save! Tabloid headlines to shake! And tabloid reporters literally lurking in the bushes. "They can make mountains out of molehills," she says. And on cue, Holley's BlackBerry lights up with messages about the celebrity news of the day: The judge is stepping down from the Lohan case. Holley shakes her head. What's the fuss? To her, it's old news, something that happened the previous week in the judge's chambers. But everyone's angling for a comment: TMZ, Radar Online, Us Weekly, Access Hollywood, even CNN and The Los Angeles Times. "When you handle [celebrity] cases, you can no longer just focus on the case. There's all this other stuff that you have to be concerned about," Holley says. "It's their livelihood. It's important for their team -- and their criminal defense lawyer is part of their team -- to be mindful of that and do whatever you can to preserve their image and reputation." When Holley joined her current firm, Kinsella Weitzman Iser Kump & Aldisert -- a mouthful she hopes some day will include "Holley" -- she worried she'd be out of her element, handling a lot of civil business cases. The boutique entertainment litigation firm is best known for negotiating kidnap victim Jaycee Dugard's $20 million settlement with the state of California and advising the executor of Michael Jackson's estate. "But many of our entertainment clients had DUIs," Holley said. "And so, Howard Weitzman and I handled Paris Hilton's DUI. And then I handled Nicole Richie's DUI and it just kind of grew from there." She darts on and off the 405 freeway and cuts across side streets flanked by dun-colored hills, talking nonstop for 30 minutes on the car's speaker phone while simultaneously juggling the BlackBerry. A tall cup of designer coffee sits untouched. Holley arrives in court at 8:40 a.m. She meets briefly in a holding cell with her client, Cruz, who is sporting a fresh shave and haircut with his orange jail jumpsuit. "He looks good," Holley says. She schmoozes with the court staff and a couple of attorneys as they wait for the judge to emerge from his chambers. Four camera crews occupy the jury box. Finally, at 9:52 a.m., court is in session. But there'll be no drama on this day. The hearing is postponed and Holley is free to go. Before she can leave the courtroom, Holley is stopped by a court deputy. He used to be a chef, he tells her. Could she pass along a "hello" to Cruz? Holley laughs. No one has to remind her: This is Hollywood. Everyone wants to be a star. The only child of a working single mom, Shawn Chapman grew up around lawyers. She met them at functions at the law offices where her mother worked as a legal assistant and office manager. She became fluent in their language and ways. "She didn't know her father, and so from day one it was Shawn and I," said her mother, Freddi King. "I think she got her work ethic from me. I wasn't a slacker." 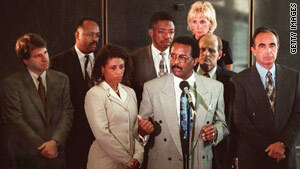 Holley, center left, worked with Johnnie Cochran on O.J. Simpson's "dream team." Simpson was acquitted. King stressed education and moved around so Shawn could enroll in the best public schools. "She was very headstrong, and she was pushing the envelope," King recalled. "She was very social. She had black friends and white friends. Everybody loved her." The day after Shawn graduated from UCLA, her mother received her master's degree in business administration. Holley taught at an urban school for a semester after graduation. But one day she brought her mother to class to show her what school was like. "She said, 'I can't really do this. These children are too far gone,'" her mother recalled. While attending classes at Southwestern Law School, Holley worked as an intern at the public defender's office. She was hooked. "It was such an amazing experience that all I wanted to do was be a public defender," Holley said. "The first couple of years are really like doing social work. And you have clients you love and care about. Oftentimes they are just poor people who have maybe stolen milk or diapers for their baby and yes, they're guilty, but you want to help them just the same." She relished the esprit de corps of the office and its young lawyers "full of zeal and idealism." Eventually, she moved up to felony cases and started defending real bad guys. Johnnie L. Cochran Jr., the legendary Los Angeles civil rights lawyer, saw her in court one day and recruited her to his firm. He had known her mother in college. "In Los Angeles, Johnnie was the end-all, be-all lawyer," Holley said. "He could be seen driving around town in a blue Rolls-Royce. He had personalized plates at a time when a lot of people didn't have personalized plates. He was very flashy and fabulous. So if Johnnie Cochran recruits you to come to his firm, you go." At the time, Cochran's firm didn't handle criminal cases, and she was reluctant to leave criminal defense work. But the hiatus didn't last long. Six months after she joined Cochran, the firm got the O.J. Simpson murder case and Holley, then still Shawn Chapman, became part of Simpson's "Dream Team." Certainly Shawn appreciated that she was there to listen and learn, and so was I. "Had Johnnie said, 'You're going to be on the case, but you're going to be working in the library and doing grunt work,' I would have been happy with that," Holley said. "But he was so generous and he believed in me. I got to cross-examine a witness. I got to argue motions. I was in every defense team meeting. He trusted my opinion. I had an equal voice." She stays in touch with Carl Douglas, who also worked with Cochran on Simpson's defense. For Holley and himself, Douglas said, "it was like grad school for young lawyers." He ranked as some of the greatest moments in his career listening to appeals master Alan Dershowitz and forensics wizards Henry Lee and Michael Baden discuss the week's events. Often, Douglas recalled, former Santa Clara University law school dean Jerry Uelmen was there, too. "'If the glove doesn't fit, you must acquit.' That was Jerry Uelmen's line. He said it and we all said, 'Wow.' It was one of those magic moments." Television footage shows a young Shawn Chapman in tears as the verdict is announced. They were tears of relief, she said. "Everyone was afraid there'd be a mistrial and we'd have to do it all over again." But, she said, when she heard the word "verdict" and saw the single-page verdict slip, she knew it said "not guilty." A guilty verdict slip would have been several pages. Then came life after the "trial of the century." Cochran's firm became a magnet for criminal cases and Holley took over that part of the practice. "I represented Tupac Shakur, who had a number of criminal cases, and a lot of civil cases arising out of pseudo-criminal behavior. We were part of the Snoop Dogg murder trial; we handled one of the defendants in that case." The Simpson case made Cochran a celebrity; he moved to New York, wrote a book and co-hosted a Court TV show with Nancy Grace before dying of a brain tumor in 2005. He influences Holley to this day. "I always ask myself, 'What would Johnnie do?' What would Johnnie do is my guiding question as a lawyer." Holley met her husband while defending Sara Jane Olson, a former 1970s radical who was a fugitive for 23 years. Holley went to work for a small firm in Beverly Hills, where the defense of former 1970s radical Sara Jane Olson occupied her for several years. Olson, accused of planting pipe bombs under a police car, ran from the law and hid in plain sight in Minnesota as a doctor's wife for 23 years. The 9/11 terrorist attacks had a huge impact on the case; prosecutors immediately began referring to the fugitive as a "terrorist." While working on that case, Holley met the man who would become her husband. She was on a flight home from Sacramento, California. About five months later, she started receiving gifts in her office from an admirer who signed the cards "Impulsive." When she finally agreed to meet him for dinner, she was relieved to see it was the man from the plane. Dorian Holley toured with Michael Jackson, was a vocal coach on "American Idol," and is now the singer with the house band on "The Tonight Show." When Shawn is busy with a case, Dorian sometimes takes their 7-year-old daughter, Olivia, to work with him. When Cochran returned to practice law in Los Angeles, Holley rejoined him. On the side, she worked as a legal correspondent for the E! Network. She and Howard Weitzman were on a panel of legal analysts for the network's daily reenactments of the Michael Jackson trial. Some thought the show was a gimmick, but it paved the way for the next step in Holley's career. After Cochran died, Holley followed Weitzman to his new firm in Santa Monica. Weitzman is always urging her to be "a real lawyer," she said. "He's talking about a big-time, big-money civil lawyer." She was heartbroken by the death of her legal mentor. But she carried with her one of Cochran's most valuable lessons: Every client matters. "There are two types of clients, as Johnnie used to say: the OJs and the NoJs. "I'm used to a lot of NoJ's. I like the NoJs, too." With all the injustice in the world, Holley shakes her head at how much breathless attention a few celebrity DUIs can get. But she deals with the crush because it's part of an unforgiving but highly lucrative landscape. She talked to the reporters and camera crews that swarmed her at the jail because, she said, "I'm an outgoing person, and so I talk to them because it's not their fault they're assigned to be there. They've just been sitting at the jail all day and all night. So it's hard for me to not be gracious and talkative. And then, after I do that, I'm like, 'Ugh, why did I do that?' That's when I say, 'What would Johnnie do?' I feel if Johnnie was alive in the TMZ era, he would be charming and chatty, too." Holley talks with the media after a judge issues a warrant for client Lindsay Lohan's arrest. TMZ creator Harvey Levin, who also is a lawyer, covered the Simpson trial for a Los Angeles television station and watched Holley play Cochran's understudy, and then come into her own. "I think she's a great lawyer. 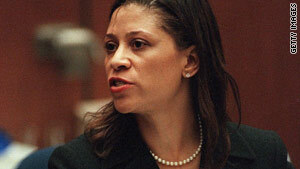 I think she's really effective," said Levin, who is teased by his staff for having a "lawyer crush" on Holley. "She learned a lot from Johnnie. Not just about dealing with clients, but dealing with high-profile clients, and how the media intersects." It's a game of mutual interests, Levin said. "The sham of this whole business is everybody says 'Hey, we're journalists, we don't get used.' That's baloney. Every reporter gets used. It happens all the time. If Lindsay decides to do the 'Today' show, they're being used." Experienced Hollywood lawyers look back with nostalgia to a simpler time when they could easily keep their secrets. But the TMZ website launched in November 2005, and the world of celebrity justice hasn't been the same since. "Kiefer Sutherland recently just had another DUI. It was clear he had prior DUI," Holley said. "Nobody knew anything about it because it was a completely different time. I think TMZ has changed everything as far as that is concerned." "Even in Nicole Richie's case -- which wasn't that long ago -- if it happened today, it would be a completely different thing. I wonder if it even would have been the same outcome because there's so much swirling around it," she added. "Anything anybody does now, it's just whoooosh!" Holley knew exactly who'd have the facts on June 25, 2009, when she heard that Michael Jackson had collapsed. Her husband was in final rehearsals for Jackson's "This Is It" comeback tour. Choreographer Kenny Ortega told him everything was fine, she recalled. But over the phone, it was TMZ's Levin who told her, "Shawn, I think he's dead." Minutes later, the news spread around the world: The King of Pop was dead. The attention showered on a celebrity lawyer can be annoying and intoxicating. But mostly, it's exhausting, Holley said. She looks forward to being ignored again when she's out to lunch with her mother, to not looking over her shoulder for photographers when she takes her daughter to the park. "When I see colleagues and they say, 'I haven't seen you in the press in a while,' I say, 'Great -- that means I'm doing my job.' I feel like I've failed as a celebrity lawyer if you see too much of me, because that means I couldn't keep it hidden. I couldn't keep it out of the spotlight, and that is not a good thing." Shawn Chapman Holley backed up Johnnie Cochran at O.J. Simpson's murder trial. But nothing could prepare her for the Lindsay Lohan case. Whether it's a scuffle with the paparazzi, a persistent stalker or a DUI arrest, Blair Berk can vaporize a celebrity's sticky legal situation. Laura Wasser is known around Hollywood as the "Disso Queen," as in dissolution of marriage. You've got a letter from Marty Singer. The words strike terror in the hearts of many journalists, bloggers and tabloid editors around the world. When Gloria Allred calls a news conference, media types know they're about to hear some dish. Harland Braun, a masterfule spin doctor, defends plenty of celebrities, but he often doesn't know what made them famous.